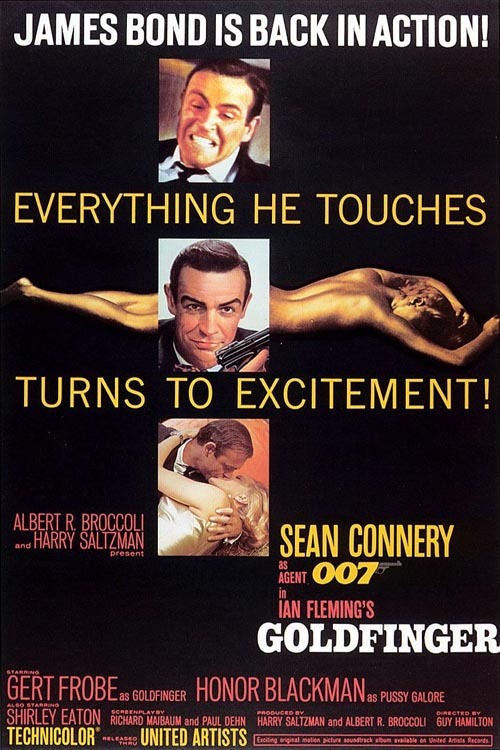 …This afternoon at 3pm I went to Edward’s to watch Goldfinger. And I watched ALL of it. I have now watched three proper James Bond films. Afterwards we watched The A-Team. They took me home at 7pm. This was the very first time I’d seen The A-Team. I wasn’t allowed to watch it at home, my mum and dad tutting it was “too violent”. But loads of people talked about it at school, and I always thought I was missing out. I wasn’t. What I saw today I remember as being a load of noisy, badly-acted, largely-meaningless rubbish. Hence my frustration at missing my usual Saturday night double bill on BBC1. Much more rewarding, naturally, was Goldfinger. None of the three Bond films I had now seen all the way through had been watched at home. The first, A View to a Kill, was in the cinema in 1985 on the recommendation of Jimmy Greaves. The second, Diamonds are Forever, was at my grandparents’ in 1986. And the third was at a friend’s house. It would only be a few months, however, before I got to enjoy a fourth. …Last night I had a nose bleed. which is when I had mine. It lasted about 40 minutes from 5.20am to 6am. I was nearly awake [when it started] anyway. centre, which is in the Fearon Hall [across town]. imaginary valley and we had to try and stop them. As usual, I’m not particularly forthcoming in my diary about just what all this role-playing was precisely in aid of. I have no memory of it whatsoever, and that’s perhaps just as well. Although none of us were at a particularly self-conscious age, I’d imagine there was already a stirring of a precocious kind among certain members of my class* along with parallel feelings of shyness among others. It was probably an occasion that was mostly inoffensive if a little bemusing. However I believe there’s another of these events coming up in a year or so, if I get that far, by which time I was at secondary school and hormones were very much a-bubbling. Euucch. I’ve just realised that the theme of today’s role-play sounds like Once Upon a Time in the West. If you think that’s a bit highbrow for a bunch of 10 and 11-year-olds, be thankful we were spared something along the lines of the event that my sister, who’s two years younger than me, had to attend later in 1987 which was based on the Hungerford massacre. *Apologies if you’re skim reading this and the only words that caught your eye in this sentence were “stirring” and “members”. …Didn’t go to school today because I was feeling ill.
lazed around listening to tapes and reading. Watched some of Dr Kildare but it was horrible. It was about someone who was trying to kill themselves. As you can see, I wasn’t extended any indulgences because of my condition, being sent upstairs to bed just before Bond make his nighttime visit to Goldfinger’s factory. Evidently it was fine for me to watch someone attempting to commit suicide, but ejector seats and laser beams and other fantastical fun were a STEP TOO FAR. …I tried out some ways to get down the stairs [without walking]. Anything to liven up a Sunday night.